The supplement Stress Relief Formula has been developed to respond to a common problem: stress. Caused by multiple factors, stress can significantly affect our well-being. Anxiety, nervous tension, insomnia, fatigue … the everyday consequences of stress are so numerous that they can seem impossible to overcome. It is precisely to help fight all these effects that this natural stress relief product has been developed. In a single capsule, it combines a selection of natural ingredients with stress-fighting properties. The various active principles selected will help lower stress levels, relieve anxiety, soothe nervous tension, restore energy and reduce fatigue. Stress Relief Formula contains extracts of several plants that offer stress and anxiety relief, including passiflora (Passiflora incarnata), schisandra (Schisandra chinensis), rehmannia (Rehmannia glutinosa), jujuba (Zizyphus spinosa), polygala (Polygala tenuifolia) and magnolia (Magnolia officinalis). Extensively-studied, these plants are recognised for their calming properties and stress-relieving effects. They are primarily used in phytotherapy for promoting calm, facilitating sleep, improving sleep quality and increasing mental performance. Some of the plants selected have also been studied for their potential to support the adrenal glands which play a key role in managing stress. 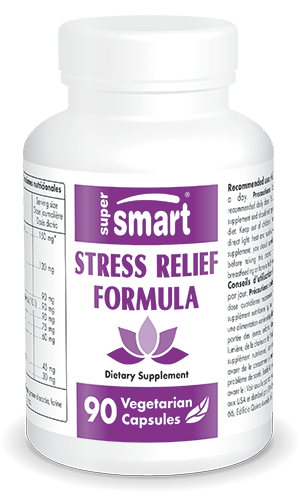 For optimal efficacy, Stress Relief Formula has also been enriched with stress relief vitamins and minerals. For example, it contains magnesium, a mineral often described as an ‘anti-stress nutrient’. It’s especially important to ensure adequate magnesium intake since a deficiency increases sensitivity to stress. It also contains benfotiamine, a form of vitamin B1 that facilitates energy production and thus combats fatigue. This quality anti-stress supplement has been further enhanced with the addition of pyridoxal-5-phosphate, a coenzyme of vitamin B6. This is involved in the production of neurotransmitters, molecules that regulate the body’s nervous system and help control stress, mood and general well-being. By combining nutrients and plants with anti-stress properties, Stress Relief Formula offers the perfect solution for coping with periods of anxiety, nervous tension, excessive workload, fatigue or ‘burn-out’. The recommended dosage for this natural anti-stress product is three capsules a day, though this can be adjusted in line with your needs and your therapist’s advice. You may also be interested in other products that provide long-term support against the effects of stress, such as melatonin supplements, often called the ‘sleep hormone’, or supplements containing GABA, a stress-relieving neurotransmitter, both of which are available as part of the SuperSmart Stress and Sleep range.